They’ve been on my list of things to make for over a year! I first saw them on this show on the FoodNetwork called “The Best Thing I Ever Ate.” They were featured in a NY restaurant, one I will probably never be able to visit, and I frantically searched for a recipe. Leave it to Fine Cooking to come through for me–best food magazine ever. Seriously. Subscribe. Now. They seem easy enough, albeit time consuming. Anyone wanna come over and make a mess of my kitchen with me?? I’m taking applications. French Onion Soup aficionados only, please! Seriously…Stef, let’s relive our college cooking days and make these asap! 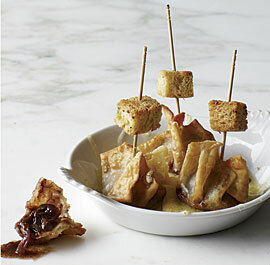 Anyone else here brave enough to make these sinful appetizers? Don’t they? I’m not brave enough to make them by myself. I need a sous chef!